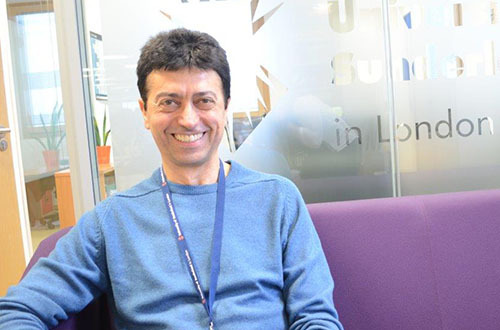 Vladimir Iantchev’s journey with the University of Sunderland is “only at the beginning” after he earned an Internship with the Student Recruitment team at the University of Sunderland in London. The Bulgarian, who completed his studies at our Canary Wharf location earlier this summer, was selected to help attract new students to the University after fully embracing life in London. After arriving in 2015, Vladimir instantly felt at home at the institution, striking a rapport with staff and students alike and taking a central role in organising events across the University. Thanks to Vladimir’s tireless work, the University played host to parties, sporting events and get-together’s. A black belt in Kung Fu, he also taught a Martial Arts class, which proved extremely popular with students. Despite this, his fondest memory of studying at Sunderland was viewing how students came together as a community during the busy and stressful exam and assignment deadline period. It came as little surprise when Vladimir was given an Internship at the University, and he is enjoying the challenge of working alongside his fellow graduates to promote Sunderland. “I am excited about this opportunity because I can learn from the others and gain professional skills, understand how to recruit other potential students and become an even better team-worker with my new colleagues in a very friendly and productive environment,” he explained. Vladimir’s future plans include studying for his Masters in Hospitality and Tourism while continuing to work for the University. He remains hugely thankful to the University, which he believes has truly changed him as a person.